Chorionic gonadotropin is a hormone found in the female body during the early months of pregnancy (it is produced in the placenta). It is in fact the pregnancy indicator looked at by the over the counter pregnancy test kits, as due to its origin it is not found in the body at any other time. Blood levels of this hormone will become noticeable as early as seven days after ovulation. The level will rise evenly, reaching a peak at approximately two to three months into gestation. After this point, the hormone level will drop gradually until the point of birth. As a prescription drug, HCG offers us some interesting benefits. 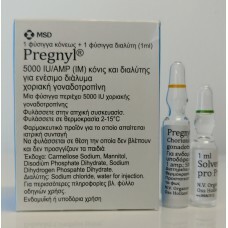 In the United States, we have the two popular brands, Pregnyl, made by Organon, and Profasi, made by Serono. 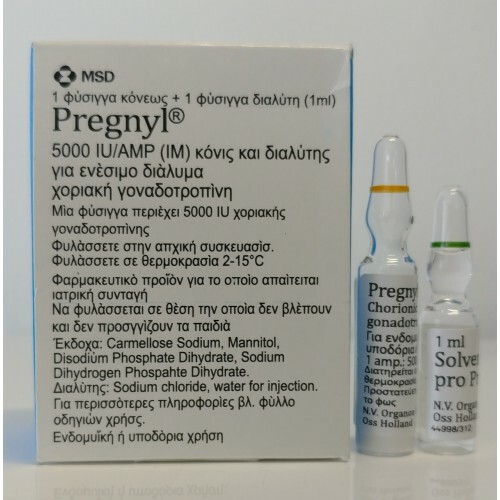 These are FDA approved for the treatment of undescended testicles in young boys, hypogonadism (underproduction of testosterone) and as a fertility drug used to aid in inducing ovulation in women. When prepared as a medical item, this hormone comes from a human origin. Although there is often a fear of biological origin products, there is little research to be found regarding pathogen or sterility problems with HCG. The problems seen with human origin growth hormone are certainly not to be repeated with HCG, as this compound is obtained in a much different way. While HCG offers the female no performance enhancing ability, it does prove very useful to the male steroid user. The obvious use of course being to stimulate the production of endogenous testosterone. The activity of HCG in the male body is due to its ability to mimic LH (luteinizing hormone), a pituitary hormone that stimulates the Leydig's cells in the testes to manufacture testosterone. Restoring endogenous testosterone production is a special concern at the end of each steroid cycle, a time when a subnormal androgen level (due to steroid induced suppression) could be very costly. The main concern is the action of cortisol, which in many ways is balanced out by the effect of androgens. Cortisol sends the opposite message to the muscles than testosterone, or to breakdown protein in the cell. Left unchecked (by an extremely low testosterone level) in the body, cortisol can quickly strip much of your new muscle mass away. The main focus with HCG is to restore the normal ability of the testes to respond to endogenous luteinizing hormone. After a long period of inactivity, this ability may have been seriously reduced. In such a state testosterone levels may not reach a normal point, even though the release of endogenous LH has been resumed. Many who have suffered severe testicular shrinkage may be able to relate, as it is often some time before normal testicle size and feelings of virility are restored if ancillary drugs had not been used. The excessive stimulation brought forth by administration of HCG can likewise cause the testicles to rapidly return to their normal size and level of activity. We are not simply looking for it to fix the problem however, as the resulting high testosterone level can itself trigger negative feedback inhibition at the hypothalamus. Estrogen production is also heightened with the use of HCG, due to its ability to increase aromatase activity in the Leydig's cells. This is due to the main action of HCG, namely the increase of cycIicAMP (a secondary messenger that regulates cellular activity). When stimulated by HCG, the ability of the testes to aromatize androgens could potentially be heightened several times greater than normal. This also may inhibit testosterone production, so we therefore use HCG only as a quick shock to the testes. The usual protocol is to inject 1500-3000 I.U. every 4th or 5th day, for a duration usually no longer than 2 or 3 weeks. If used for too long or at too high a dose, the drug may actually function to desensitize the Leydig's cells to luteinizing hormone, further hindering a return to homeostasis. Timing the initial dose is also very crucial. If your were coming off a cycle of Sustanon for example, testosterone levels in your blood will likely stay elevated for at least 3 to 4 weeks after your last injection. Taking HCG on the day of your last shot would therefore be useless. Instead one would want to calculate the last week in which androgen levels are likely to be above normal, and begin ancillary drug therapy at this point. In this case HCG would be started around the third or fourth week. Likewise, after ending a cycle of Dianabol (an oral) your blood levels will be sub normal after the third day. Here you may want to begin HCG therapy a few days before your last intake of tablets, giving it a few days to take effect. One would also want to give some thought to the level of suppression that the cycle might have brought about. After an 8 week cycle of Equipoise for example, 1500-2500 I.U. would likely be a sufficient initial dosage. The lower amount of hormonal suppression one associates with this drug would probably not require much more. On the other hand, 750-1000mg of Sustanon per week might incline the user to inject a much larger HCG dose, perhaps as much as 5000 I.U. for the opening application. It may thereafter also be a good idea to reduce the dosage on subsequent shots, so as to step down the intake of HCG during the two or three weeks of intake. As discussed above, HCG acts only to mimic the action of LH. It is likewise not the perfect hormone to combat testosterone suppression, and for this reason it is used most often in conjunction with estrogen antagonists such as Clomid, Nolvadex or cyclofenil. These drugs have a different effect on the regulating system, namely inhibiting estrogen-induced suppression at the hypothalamus. This of course also helps to restore the release of testosterone, although through a much different mechanism than HCG. A combination of both drugs appears to be very synergistic, HCG providing an immediate effect on the testes (shocking them out of inactivity) while the anti-estrogen helps later to block inhibition on the hypothalamus and resume the normal release of gonadotropins from the pituitary. The typical procedure involves giving the Clomid/Nolvadex dose from the start with HCG, but continuing it alone for a few weeks once HCG has been discontinued. This practice should effectively raise testosterone levels, which will hopefully remain stable once Clomid/Nolvadex have been discontinued. While unfortunately there is no way to retain all of the muscle gains produced by anabolic steroids, using ancillaries to restore a balanced hormonal state is the best way to minimize the loss felt with ending a cycle.